Cóta Raiftearaí - An Taoiseach Leo Varadkar. 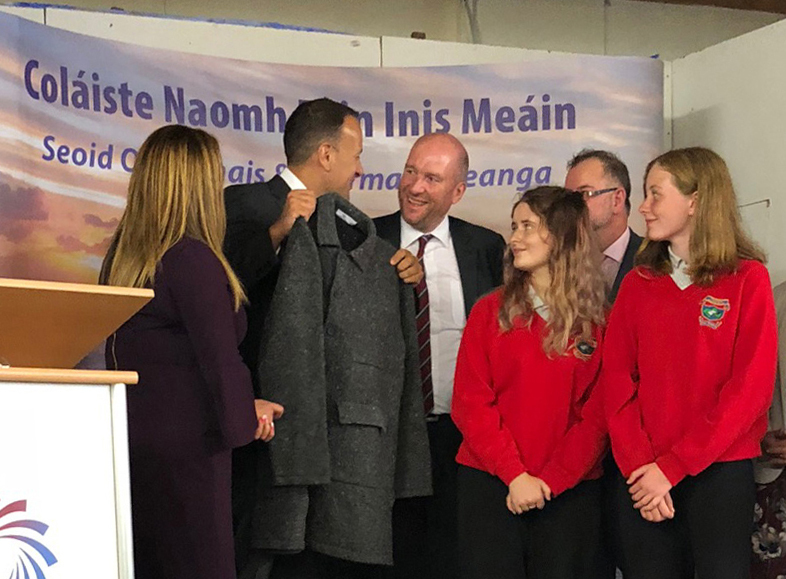 | Inis Meáin Knitting Co.
Taoiseach, Leo Varadkar accepting a gift of Cóta Raiftearaí at the official opening of newly independent Coláiste Naomh Eoin, Inis Meáin this week. Inspired by the famed 19th century poet Raftery and his epic poem Seanchas na Sceiche. In it he berates a bush, which he found by the roadside and which failed him in his search for shelter. We imagine Raftery sheltering by the bush in his long coat. His dress was often remarked upon, especially his coat – Cóta Raiftearaí – which we recreated in a beautiful soft Donegal blend of of 20% Cashmere / 80% Merino wool.